Oh say did you know these 7 facts about The Star-Spangled Banner? We’re all familiar with Francis Scott Key’s “The Star-Spangled Banner,” especially as a ritual opening at our county’s favorite sporting events. …the song evokes potent emotion and memory. To celebrate the anthem’s 200-year anniversary, we explore its historical significance. From the war of 1812, to World War I, and up to today’s traditions, it’s had a hand in molding the modern image of America. Thousands of renditions are played each year, but how much do you really know about the anthem? Mark Clague is a professor of musicology, the director of research at the University of Michigan and the founder of the Star-Spangled Music Foundation. He’s a big believer in the song’s impact on American culture. But, according to Clague, there is no traditional way to sing the anthem. And while the song is a marker of community, it is also a marker of individuality. In 1814, Francis Scott Key wrote the lyrics while he was detained on a British ship in Baltimore. Key, who was on diplomatic mission, was inspired after witnessing the American victory at Fort McHenry, which he believed was an impossible task. Before it was named “The Star-Spangled Banner,” it was called “The Defense of Fort McHenry.” Key eventually changed the name to better represent the flag and the United States. President Herbert Hoover signed the bill that made the song the national anthem in 1931. Prior, the United States Navy had used it in official ceremonies. During the Civil War, the Union army translated the song into German with hopes of recruiting German soldiers. 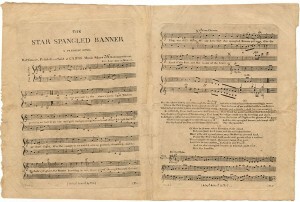 Since then, “The Star-Spangle Banner” has been translated into several other languages including Spanish, Polish, French, Italian, Hebrew, Yiddish, Latin and Native Hawaiian. In 1861, Oliver Wendell Holmes Sr. added a verse. Despite using the words “the land of the free,” Francis Scott Key had been a slave owner, and members of the Confederate Army wanted to claim his anthem. Holmes, an influential writer from Boston, wrote new lyrics advocating that American slaves be unchained. Holmes’ addition now appears in most official publications of the lyrics. The first sporting event to hear “The Star-Spangled Banner” was a baseball game in 1862 in Brooklyn, New York. The anthem was performed at the first World Series in 1903 in Boston; many believe it was first performed at the 1918 World Series. One of the most famous renditions of the song was performed by Jimi Hendrix at the 1969 Woodstock Festival. Though that was his most iconic performance, Hendrix actually performed his version over 60 times during a two-year period.